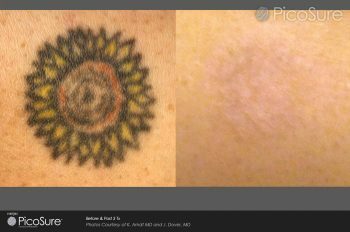 Home > Blog > Does Tattoo removal cream work? If you are in the situation that many people are currently finding themselves in…that is really regretting a tattoo and just wanting it gone; you are probably looking around for what methods really work. There are quite a few different options out there. There are a few different things that you are probably hoping to find. Firstly that it actually works, secondly that it is not too painful and third of all that it is not too expensive. Your priorities may vary depending on budget and so on but I think these are the key points. When looking for a cheap and pain free option tattoo cream often seems like a good way to go. It is not expensive at only approximately £65 and it is said to be completely pain free. That is where the good news ends for tattoo removal cream I am afraid. Per current research tattoo removal cream does NOT remove the tattoo. The most positive results given are a slightly faded or lightened tattoo but by no means removed. The problem with that is if you don’t like your tattoo to begin with seeing it there still but in a slightly faded way is really not going to help. The other problem is that tattoo removal cream also has some side effects of skin irritation. Some products even contain acid and other dangerous chemicals meaning they can actually leave you scarred. So if you are really looking for an effective tattoo removal method I would suggest that you try Laser Hair removal. Though it is not amazingly cheap or pain free, at least all of the effort going into getting the tattoo removed can really pay off with a truly gone tattoo and don’t worry too much about the pain or the price either…they are both bearable. And you can really achieve a completely removed tattoo and that is the point right!